Burger King gets into the spirit of Halloween with the debut of new Scary Black Cherry Frozen Fanta, a pitch black, black cherry soda-flavored ice slush drink. The frosty beverage is available for a limited time through November 12, 2018. 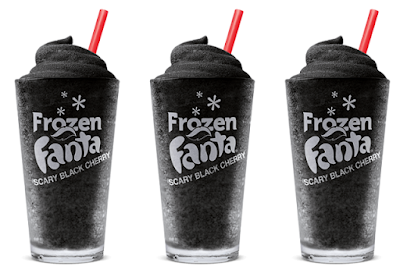 Given the color, be warned that the Scary Black Cherry Frozen Fanta may turn your mouth and/or stool a darker color. Some locations may have the drink for $1 as part of a Frozen Fanta promotion.